Collects material from Peter Parker, the Spectacular Spider-Man #86; Amazing Spider-Man Digital #11, 16; Marvel Tales (1964) #216-217, 224-226, 235, 248, 250-252; Petey #1; Fantastic Four Roast; Fred Hembeck Destroys the Marvel Universe; Fred Hembeck Sells the Marvel Universe; Amazing Spider-Man Annual #23; Spectacular Spider-Man Annual #9, 11; Web of Spider-Man Annual #5; Untold Tales of Spider-Man #-1, Annual '97; Amazing Spider-Man Family #7; Peter Porker, the Spectacular Spider-Ham #4; Marvel Super-Heroes (1990) #1; What If? (1977) #34; Bug #1; Stan Lee Meets Spider-Man; What The--?! #4; Iron Man (1968) #112; Captain America (2005) #50; various Marvel Age, Collectors' Preview, Director's Cut, Daily Bugle strips. A riotous roundup of stories by one of comics' funniest cartoonists! 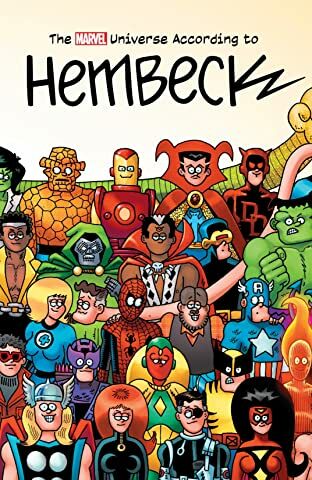 Fred Hembeck roasts the Fantastic Four, aided and abetted by the 1980s' best artists — then singlehandedly destroys the Marvel Universe! And it's wall-crawling wackiness times three with Spider-Man, Spider-Ham and young Petey Parker! 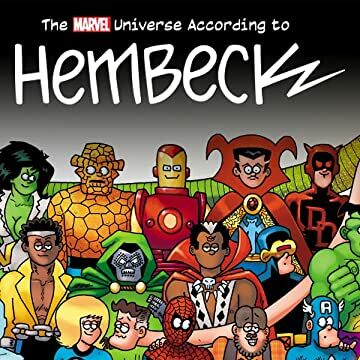 Plus: Who loves Hembeck's humorous hoodoo with Brother Voodoo? You do! But wait — there's more! Packed with gags, guffaws and groaners, it's a heaping helping of Hembeck hilarity you just have to have!